My Airline Boarding Pass Does Not Have TSA Precheck On It – How Do I Get It? Why isn’t the tsa pre✓ on my boarding pass? It is not printed on the boarding pass and it was the last few times I have flown a domestic route. Do I need to sign up or is it a random choosing process? Does the TSA sometimes give you precheck and other times it does not? Can you explain this to me? I am traveling with my father and he has the TSA Precheck on his boarding pass. Since we are traveling together, can I use the TSA precheck expedited line also? TSA Precheck – How To Get Approved? To guarantee you get TSA precheck on every domestic flight, you must go through the TSA precheck application process and pay $85. This includes showing documents and going to an interview. If you have not applied for the TSA precheck and gone through the application process, you do NOT have guaranteed TSA precheck. If you have not have applied and been approved for TSA precheck, the TSA may randomly assign it for you on your boarding pass regardless if you applied or not. Concerning your question about traveling with someone who has a TSA precheck on their boarding pass and you do not… Family members ages 12 and under traveling with an eligible parent or guardian with a TSA Pre indicator on their boarding pass can participate in expedited screening. However… Family members 13 and older must go through standard security lanes or should apply for a DHS trusted traveler program. TSA Precheck is an expedited security screening program connecting travelers departing from airports within the United States with faster security and a better travel experience. Passengers considered low risk who qualify for the program can receive expedited screening either as a member of the program or another specific trusted traveler group. You can complete the online application here or you can complete the entire process in person at an application center. Schedule an appointment online or by calling (855) 347-8371 weekdays, 8 a.m. to 10 p.m. ET. Walk-ins are okay but appointments are priority. -Provide required documentation and fingerprints. -Bring your current U.S. passport or a driver’s license and birth certificate. -Pay a non-refundable $85 fee valid for five years with a credit card, money order, company check or certified cashier’s check. Once you go through the application process and get approved, you will be assigned a KTN: Known Traveler Number. Once you get a Known Traveler Number (KTN), you will need to be add it at the time of booking your flight reservation. (You can add it to an already booked reservation if you got approved for TSA after you bought the ticket.) This number (KTN) is what you will use when booking your airline ticket online. This tells the airline you are TSA Precheck approved and the TSA precheck will then be available to you. Participating airlines will print the TSA precheck indicator on your boarding pass. When you get to the airport be sure to look for the signs that say TSA PRECHECK. If for some reason the TSA precheck is not on your boarding pass even when you have applied and have your KTN, then you need to get in contact with either the airline or the TSA to get it added on. Go through airport security faster! 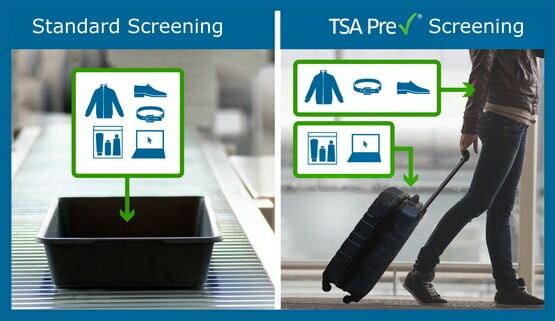 Once you are approved by the TSA to get Precheck, you will NOT have to remove your shoes, laptops, 3-1-1 liquids, belts, or light jackets. You will get super fast security screening meaning less time in line. It is now available at more than 150 airports with 13 airlines participating. TSA precheck – Go through airport security faster! Your boarding pass will have the TSA Precheck symbol printed on it. See image below. Click here for a TSA airport map and choose the state, then airport to see if that airport has TSA Precheck. 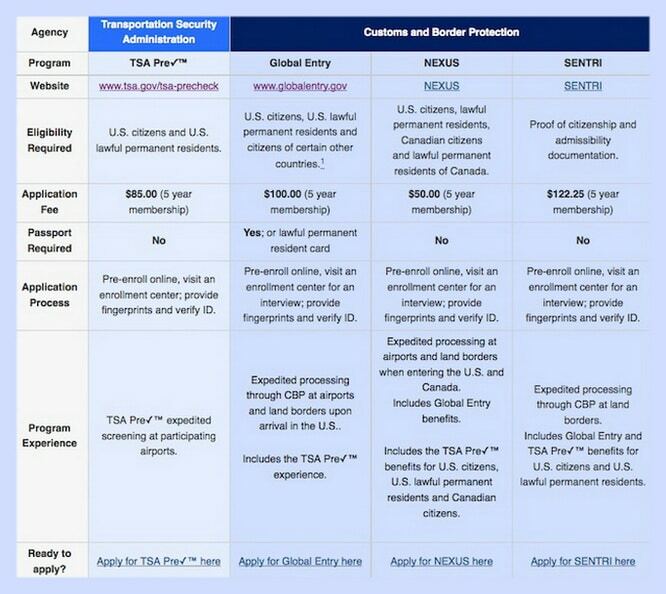 How to Get TSA PreCheck If Your Flight Doesn’t Qualify? You may be able to show your Global Entry ID card at airport security to get into the faster Precheck lane. hassles and less stress. No need to remove shoes, laptops, liquids, belts or light jackets. If you have other questions about how the TSA Precheck program works, please leave a comment below and we will assist you with the information you need.